"A quick and easy method for providing baby food for your little one without any added preservatives, sugar, or salt. Can store cooked puree for 3 days in refrigerator or 3 months in freezer." Fill a small saucepan with water; add sweet potatoes. Bring water to a boil and cook sweet potatoes until tender enough to break apart with a fork, 25 to 30 minutes. Transfer sweet potatoes to a food processor or an immersion blender cup, reserving the cooking water. 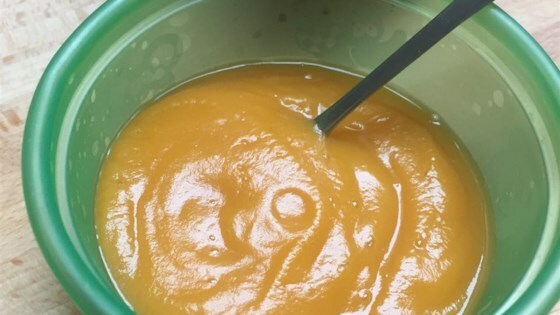 Blend sweet potatoes until smooth. Add 1/2 to 3/4 cup cooking water and blend until desired consistency is reached. Chef John serves up pure sweet potato in a dreamlike puffy form! Breast milk or formula can be used instead of cooking water. Please consult your pediatrician before starting your baby on solid foods.